Thanks for the Triple Awards! 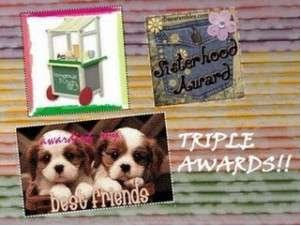 Gin of E-Pamilya gave me these wonderful Triple Awards! Thanks so much! 1. Put the logo on your blog or post. 3. Be sure to link to your nominees within your post. 5. Share the love and link to this post and to the person from whom you received your award. To keep the ball rolling, I’m passing on this award to Wenchie, Sheila, Juliana, Evan’s Mom, Melanie, and Jacky. 2 Responses to Thanks for the Triple Awards! Thanks much! Appreciate the thought…. hello there tetcha, thanks for the award, im gonna post that in my blog. give my hugs to your baby justin, have a good day! © 2009 Pensive Thoughts. Look At Me theme created by Squeesome.